Behind every successful inclusive school is a great principal with passion, vision, and a practical plan. 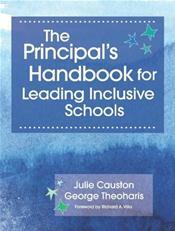 With so much riding on their strong and proactive leadership, every principal and administrator will want this how-to book: the essential guide to bringing schoolwide inclusion from theory to practice. Covering everything from the basics of special education to the everyday nuts and bolts of making inclusion work, two renowned inclusion experts give readers clear guidance they can use right away to lead a fully inclusive school where every student learns and belongs. New and veteran administrators will discover how to make schoolwide (and districtwide) reforms that support social and academic success-and help all students reach their full potential. ... PRACTICAL MATERIAL: Concrete, real-world tips and strategies; first-person stories from school leaders; answers to commonly asked questions in every chapter; helpful checklists and forms on co-teaching, behavior support, school reform planning, and more.